Dear respected Marshal Kim Jong Un has been leading the DPRK for the past six year and has pushed forward the Songun revolutionary cause and Juche revolutionary cause following in the footsteps of the great generalissimo's Kim Il Sung and Kim Jong Il. 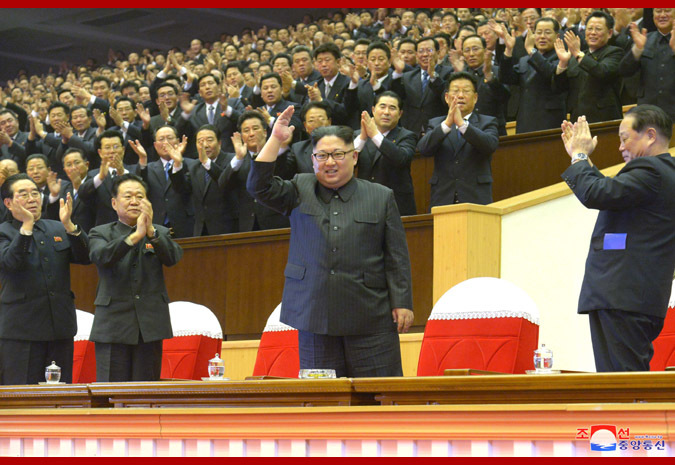 Dear respected Marshal Kim Jong Un is holding aloft the red banner of Kimilsungism-Kimjongilism. 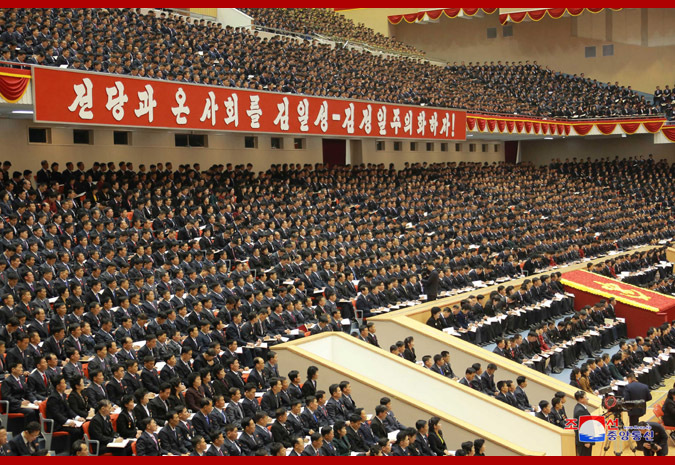 Respected Marshal KIM JONG UN has followed a people-orientated policy always putting the people first. Under his leadership many new cultural complexes , hospitals ,schools and whole new streets such as Changjon Street, Mirae Scientists Street and Ryomyong Street have sprang up adding lustre to the people's lives and opening up vistas of improved material and cultural standards. During the past year epochal and phenomenal achievements have been made in the work of defence upbuilding . 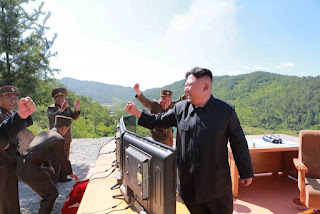 ICBM tests were carried out one after the one , shaking the imperialists rigid with fear , and the DPRK conducted its 6th nuclear test .Thus People's Korea has become an advanced ,invincible nuclear power under the leadership of respected Marshal KIM JONG UN . Dear respected Marshal Kim Jong Un has become known as a great world revolutionary leader because of his tough and revolutionary anti-US,anti-imperialist stance and because he has won victory in the showdown of power with the US to defend Korean style socialism.He knows no fear of imperialism and does not compromise with the imperialists ! 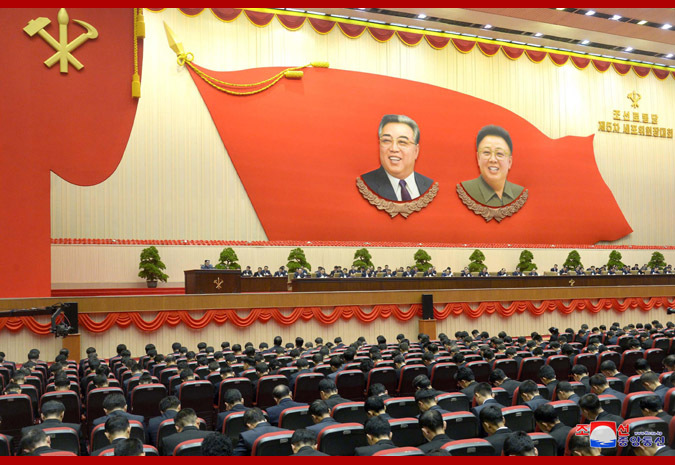 Glory to respected Marshal KIM JONG UN on the 6th anniversary of his appointment as Supreme Commander of the Korean People's Army , the anti-imperialist revolutionary armed force of Songun ! 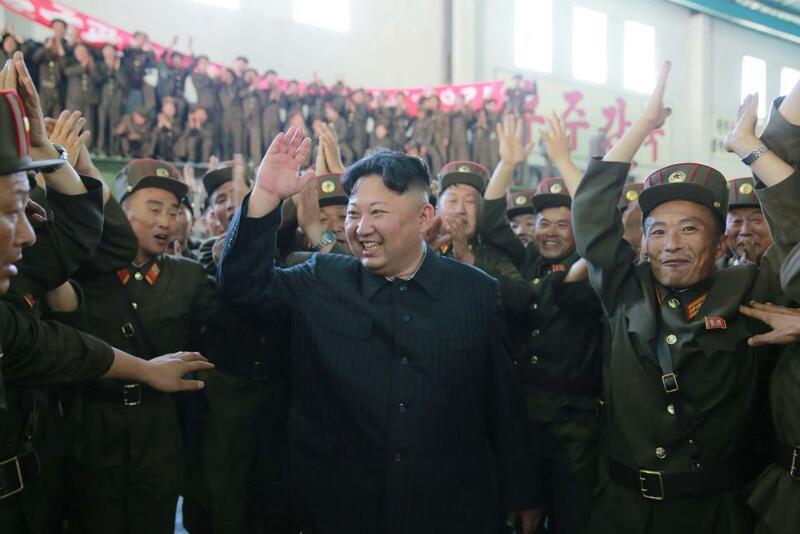 Respected Marshal KIM JONG UN has built up the revolutionary armed forces of People's Korea into an invincible revolutionary armed force equipped with a nuclear deterrent and ICBMs ! 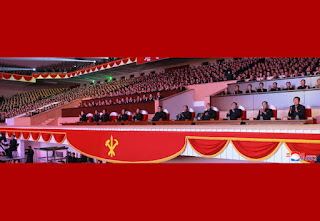 Long live the dear respected leader Marshal KIM JONG supreme commander of the heroic and invincible Korean People's Army ! 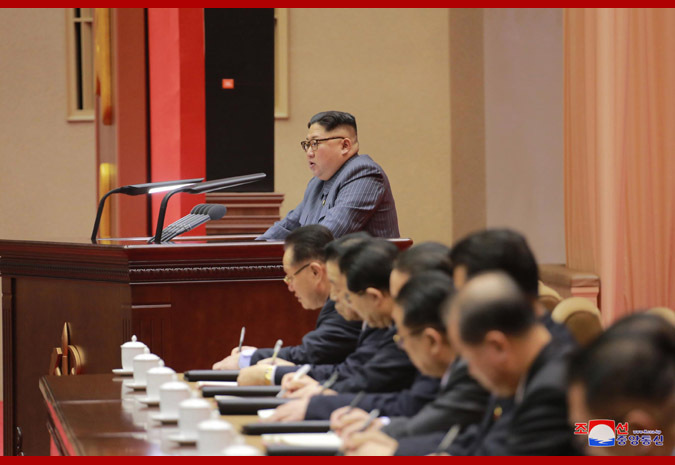 Pyongyang, December 30 (KCNA) -- The Korean Central News Agency released a detailed report on the situation of the Korean peninsula this year. 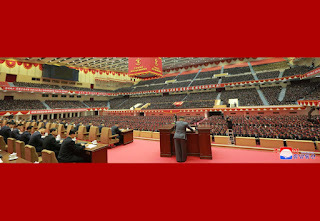 The situation of the Korean peninsula is an epitome of the world political situation. 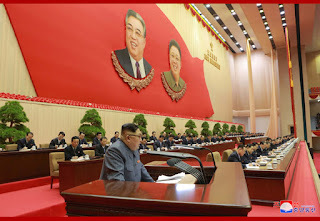 The Trump administration, which set the solution of the nuclear issue of the DPRK as a primary task of its diplomacy and security policy and its DPRK policy as "maximum pressure and engagement," has resorted to the hard-line hostile policy toward the DPRK, the degree of which dwarfs the policies of the former administrations, openly talking that "approach to the DPRK precisely means preemptive strike." 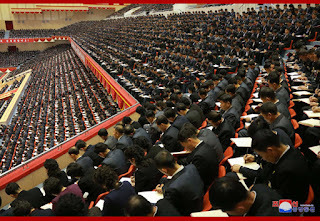 So the international community focused its attention to the Korean peninsula from the outset of the year. 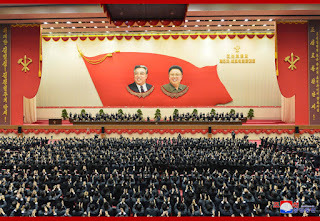 Our party and state, indicating the path to be covered by socialist Korea in the new year, clarified the principled stand that it would continue bolstering the capabilities for self-defense and preemptive attack with the nuclear force as the pivot as long as the U.S. and its vassal forces persist in nuclear threat and blackmail and war drills under the mask of annual ones at the doorstep of the DPRK. On February 12 the DPRK successfully test-fired the new type strategic weapon system Pukguksong-2, ground-to-ground intermediate-range strategic ballistic rocket. 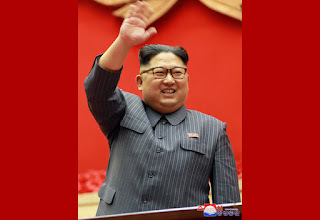 On March 18, it succeeded at once in the on-the-ground test of the Korean-style new type high-thrust engine, which heralded the birth of the Juche-based rocket industry and declared the establishment of eternal foundation for rounding off the state nuclear force. On July 4 and 28, it successfully test-fired ICBM Hwasong-14 capable of striking the heart of the U.S. 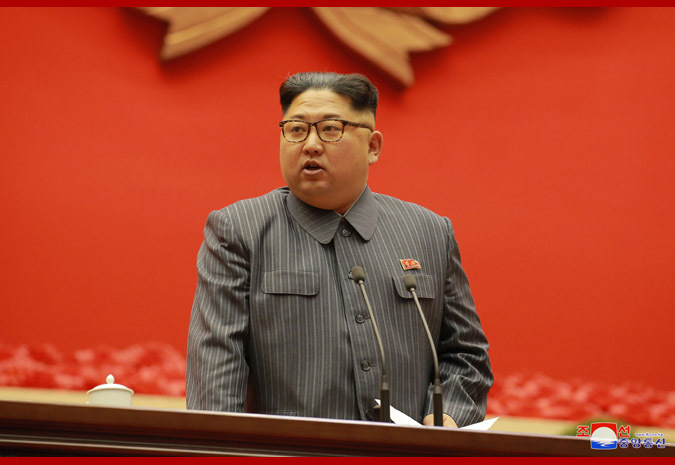 The U.S. cooked up new sanctions acts against the DPRK and spearheaded the adoption of the UN "sanctions resolutions" one after another against the DPRK. Amid the spreading of the story about "war in August" along with such belligerent remarks as "preventive war" and "preemptive attack", Trump said "north Korea will be faced with fire and fury" and "if a war breaks out, it will be fought on the Korean peninsula and if thousands die, it will also be on the peninsula." 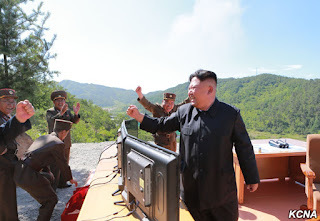 The DPRK's perfect success in the ICBM-ready H-bomb test conducted on September 3 was the greatest victory which put the country on the status of a world-class nuclear power and provided a creditable military guarantee for putting an end to the history of the U.S. imperialists' nuclear blackmails. On September 12 the DPRK finished the project for making its medium-range strategic ballistic rocket Hwasong-12 combat-ready, thus clarifying that its final goal is to keep balance of force with the U.S. in actuality. On September 19 Trump dared cry out for "totally destroying" the DPRK in the UN arena, unheard-of rubbish, only to stun the world public. The DPRK clarified its toughest countering will to deal with the U.S most ferocious declaration of war with fire surely and definitely. The Second Plenary Session of the 7th Central Committee of the Workers' Party of Korea on October 7 once again clarified the principled stand of our Party and state to preserve the noble mission and nature of the DPRK's nukes which its people gained through a hard struggle and to protect peace and security of the Korean peninsula and the region and the rest of the world. On November 29, the DPRK succeeded in the test-fire of new type ICBM Hwasong-15 reflecting its tremendous might as a world-class military power. 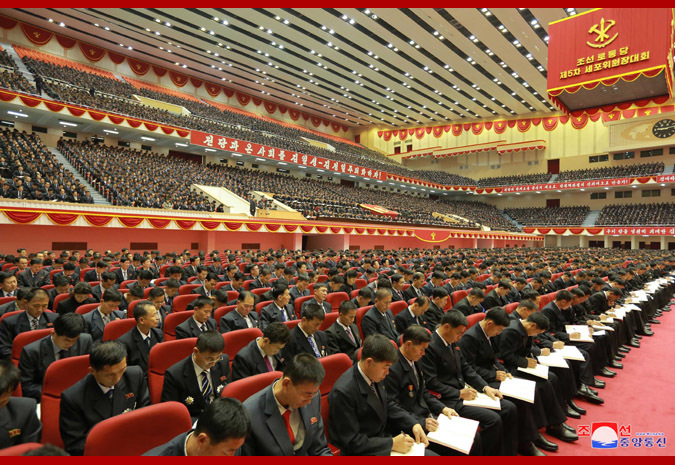 The U.S. persistent moves against the DPRK in political, economic, military, diplomatic and all other fields till the end of this year could not stop even a moment the advance of the DPRK confident of the victory of its cause. 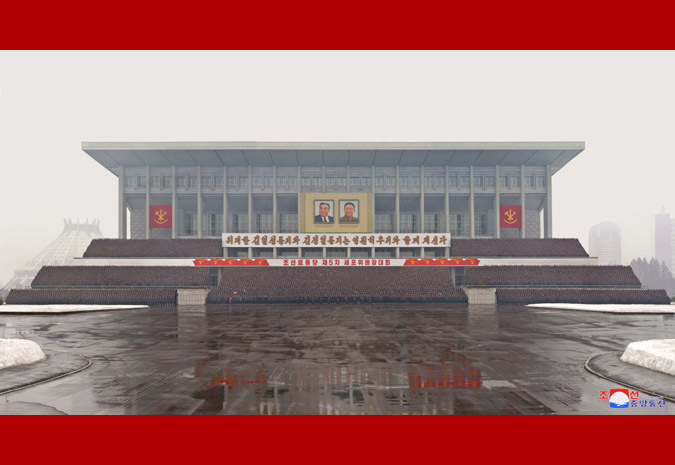 Thanks to Juche Korea which is standing in the outpost for preserving independence, justice and socialism with the nuclear treasured sword of justice, a nuclear war threatening the world was prevented and the desire of mankind for peace preserved. Do not expect any change in its policy. Its entity as an invincible power can neither be undermined nor be stamped out. Pyongyang, December 30 (KCNA) -- A congratulatory performance of the State Merited Chorus and the Moranbong Band was given here on Friday for the participants in the 5th Conference of Cell Chairpersons of the Workers' Party of Korea. 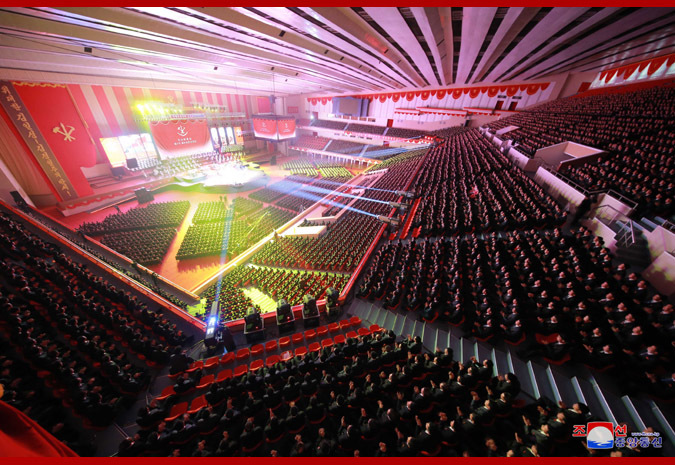 The numbers of the performance included light music and serial songs "We Have Great Party", female vocal solo and pangchang "The Party Is My Mother" and male solo and chorus "Fly High, Our Party Flag". 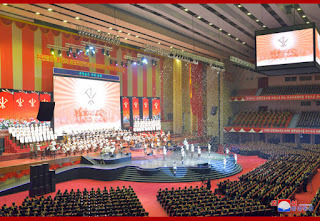 They vividly represented the Korean army and people's deep reverence and trust in their Supreme Leader who guides the revolutionary cause of Juche always along the road of victory by glorifying the WPK as the glorious Kimilsungist-Kimjongilist party and developing it into the ever-victorious staff of the revolution deeply rooted among the popular masses. At the end of the performance, the audience broke into thunderous cheers of "hurrah!" 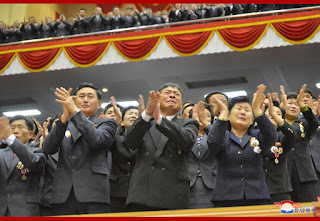 in token of their reverence for the Supreme Leader. Since taking the position of Supreme Commander of the Korean People's Army , dear respected Marshal KIM JONG UN has proved to be a great anti-imperialist supreme commander leading the Korean people and world people in the struggle against US and world imperialism , continuously defying the US imperialists by launching ICBMs and carrying out nuclear tests. Korea is the one place on earth where imperialism and socialism stand in confrontation with each other . 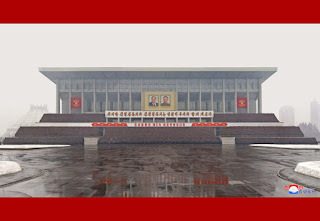 After the frustration of socialism in the former USSR and other countries of Eastern Europe , Korea become the focal point of the intense confrontation between socialism and capitalism , as some people say, the last frontier of the Cold War .Therefore in becoming Supreme Commander of the Korean People's Army respected Marshal KIM JONG UN assumed the responsibility for not only the defence of the independence of People's Korea and its Juche-based socialist system but for defending world socialism . 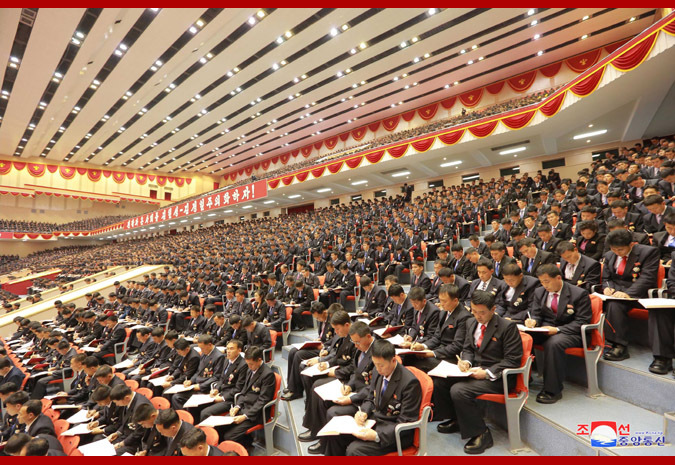 After the early 1990s all eyes turned towards People's Korea ,people wondered whether would it defend socialism ? Would it stand up against the intrusion and invasion of US imperialism ? During the 1990s and afterwards US imperialism went on the rampage. It declared that the world was unipolar and invaded countless countries such as Somalia, Iraq, Rwanda , Yugoslavia , Afghanistan ,Libya and others . The US greatly expanded its global empire of military bases . However People's Korea under the leadership of the great leader comrade KIM JONG IL resisted the US and deveoped in depth Songun politics. Respected Marshal KIM JONG UN has a firm anti-imperialist and anti-revisionist perspective so is leading the Korean people towards final victory against US imperialism and world imperialism . a powerful inspiration to the world revolutionary peoples fighting against US imperialism . I am convinced that dear respected Marshal KIM JONG UN will succeed where the Soviets and Chinese failed by winning final victory in the struggle against US imperialism ,defeating US imperialism totally in Korea and the Asia-Pacific and basically reunifying Korea on the terms of independence. 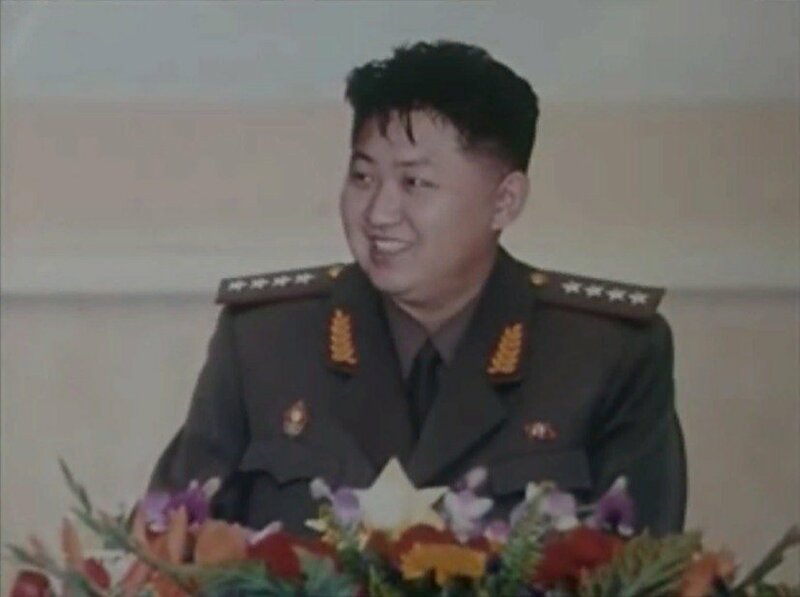 supreme commander of the KPA and Korean people but the great anti-imperialist supreme commander on the world front against imperialism ! Every moment faces imperialist tricks. Really it is anti democracy. A shinning history of arena. In dustbin of evil yard. Marshal KIM JONG UN in 2017 had got the better of the senile US leader Trump . 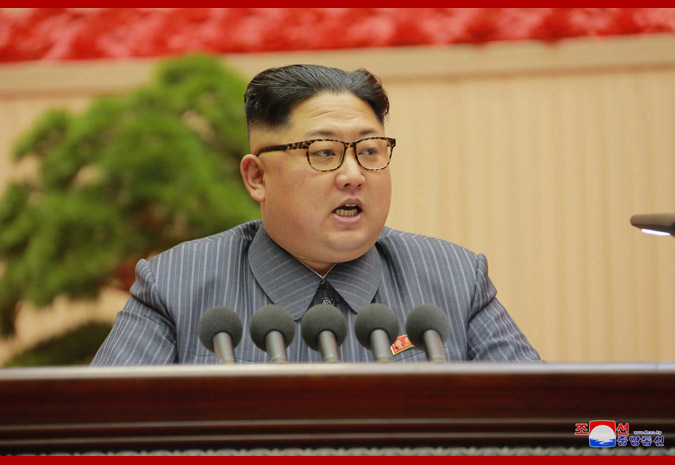 Marshal KIM JONG UN ,about developing an ICBM, had said that a DPRK ICBM capable of hitting the US was a thing that 'would not happen ' . This implied that the US imperialists under the command would physical stop the DPRK from developing an ICBM that could hit the US mainland . However on the 4th of July the so-called ' Independence Day ' of the US (in reality a colonization day in which the Yankees seized America from the native Americans ) the DPRK successfully tested the Hwasong 14 followed by another test of the Hwasong 14 on the 28th of July , a test of the Hwasong 12 medium and long range ballistic missile on the 16th of September and finally the test of the Hwasong 15 ICBM on the 29th of November .The Hwasong 15 ICBM flew to a height greater than the International Space Station and is capable of striking the entire US mainland .As media commentators said it is a 'game changer' .Thus respected Marshal KIM JONG UN had defeated Trump and made Trump look foolish , proving that his words were totally empty. Trump and the US imperialists became powerless, impotent in fact, to stop the DPRK from developing and testing missiles and making great strides forward in missile technology and design . On the 3rd of September ,a quiet Sunday , the DPRK on the order of respected Marshal KIM JONG UN carried out the test of a H bomb for an ICBM , its 6th nuclear test .Western experts estimated the yield to be 120 kilotons and set off a tremor of 6.1 magnitude . The test was said to be 7 times more powerful than the bomb that destroyed Hiroshima in August 1945. In othe words another great qualitative advance towards the height of an advanced nuclear power. US imperialism and world imperialism as well as big power chauvinism. Respected Marshal KIM JONG UN has scored a great victory over US imperialism by breaking its nuclear monopoly.Korea which once had lost its independence to Japan because it could not make its own weapons but know it is a nuclear power standing on a level playing field with the US. The victories of 2017 scored by the DPRK under the command of the dear respected Marshal KIM JONG UN followed on from earlier victories. 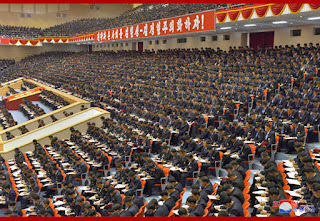 Since becoming KPA Supreme Commander at the end of 2011 Marshal KIM JONG UN has carried forward the Songun revolutionary leadership started by the great leader comrade KIM JONG IL .The first thing Marshal KIM JONG UN did in 2012 was to visit the Seoul Ryu Kyong Su no 105 Tank division of the Korean People's Army , the place where the great leader comrade KIM JONG IL started his Songun revolutionary leadership on the 25th of August 1960. Thus it demonstrated that the Songun revolutionary leadership would continue and continue it did as respected Marshal KIM JONG UN proved to be a dynamic as well an iron-willed commander who led from the front scoring victory after over the corrupt and decadent US imperialists. Respected Marshal KIM JONG UN is not an armchair general or deskbound leader but goes on to the front-line , to the flashpoints ,where imperialism and socialism confront each other with guns levelled , such as Panmunjom and the West sea islands. took resolute and decisive measures which smashed the aggressive moves of the US imperialists , thus defeating them without a shot being fired. 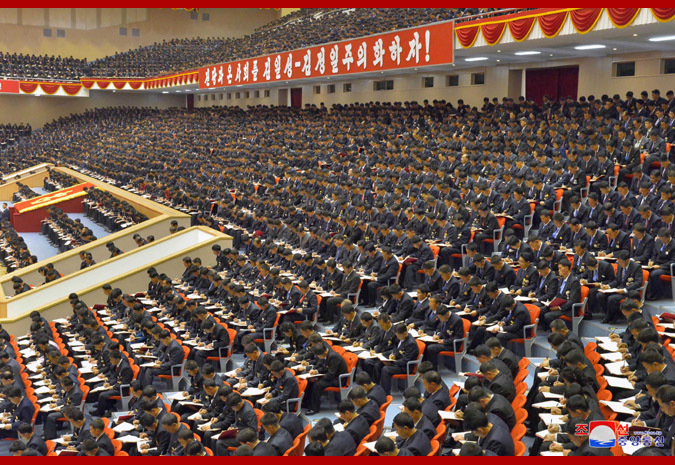 Marshal KIM JONG UN the KPA can defeat the US imperialists ,liberate south Korea and reunify the country . 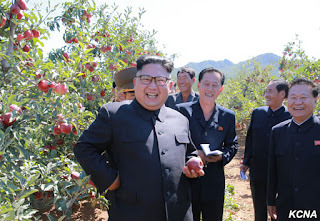 Respected Marshal KIM JONG UN is an ever victorious iron-willed brilliant commander who has defeated US imperialism and will inflict the final and total defeat on the US imperialists . Glory to the 6th anniversary of his appointment as Supreme Commander! 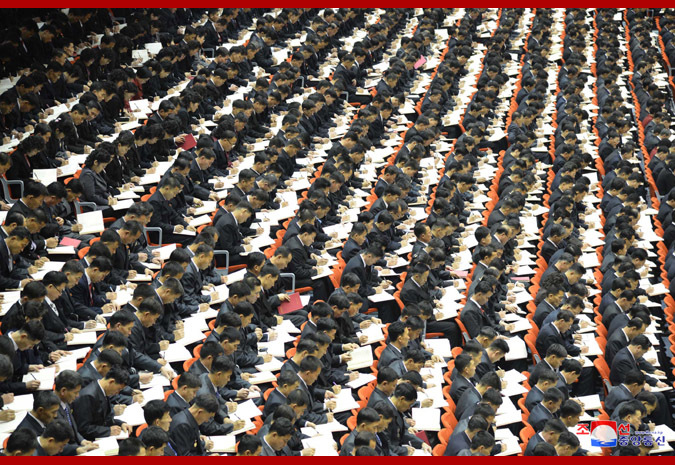 Pyongyang, December 26 (KCNA) -- The Japanese authorities blustered that they would seek the heated-up discussion for the reexamination of the "defense guidelines" from the beginning of 2018, under the pretext of "threat from surrounding countries". Prime Minister Abe and Defense Minister Onodera called for "reexamining the guidelines so that they can provide defence capabilities in the true sense of words", stressing that "Korea is pushing forward nuclear and missile development, China is beefing up military capabilities and Russia is busy in its activities in the northern areas". Their intention is to reexamine and modify the defense guidelines to be the one of "defending Japanese nationals" from "threats" from the DPRK, China and Russia. So inveterate is the crafty traits peculiar to the island nation. 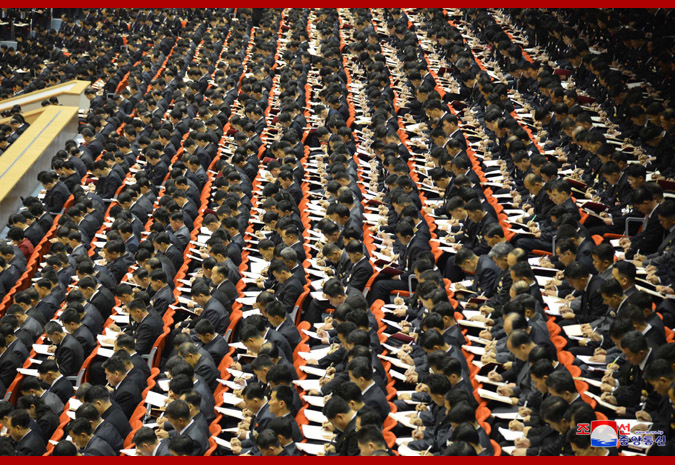 It is Japan's bad habit to find fault with others and seek its own interests as unanimously commented by the international community. 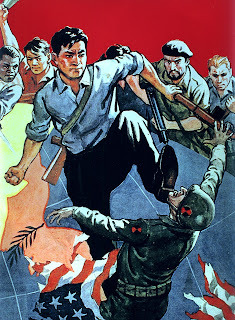 Japan is so shameless as to claim that its past blood-stained aggression, censured by humankind, was to "liberate Asia from Western European imperialists". The ultimate purpose sought by Japan is to turn itself into a "normal state" capable of fighting a war from a "special country" which is disallowed to have the right to possess military force, to say nothing of the belligerent right, as a war defeated nation and a war criminal state. It is trumpeting about "threat from surrounding countries" as a "legitimate pretext" for realizing this. Toward the end of 2013 the Abe group worked out "defense guidelines" in which it expanded the essence of "security" into "international security" from national security, under the pretext of "aggravated security environment around Japan". 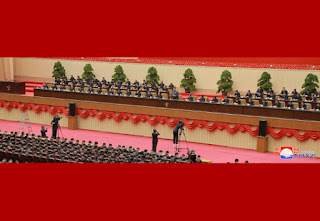 Here, Japan designated the DPRK as a "crucial instable factor" and specified that it would grant the "Self-Defense Forces" with the capabilities as marines as well as the capabilities for mobile deployment in order to promote "comprehensive improvement of counteraction" to "ballistic missiles" from the DPRK. Accordingly, Japan removed political and legal huddles one after another that had stood in its way of militarization and reinvasion, and expanded the scope of the overseas military operation of the SDF after massively increasing the military spending. It has also put in place the pretext and military conditions for intervening in case of emergency on the Korean peninsula. Recently it is calling for possessing 1 000-5 000 km medium range missile which has central China and Russia within the firing range while getting keen on the access to "capabilities for attacking enemy positions" and introduction of "Aegis Usher", interceptor missile system for ground deployment. What matters here is the reason why Japan is modifying the "defense guidelines" earlier than schedule which it had originally planned to be 10 year-term defense guidelines. 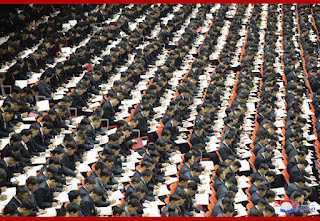 The fact that the focus of the reexamination would include tolerance of the exercise of "right to collective self-defense" and increased purchase of American arms and Japan-U.S. cooperation clearly proves the intention sought by Japan. 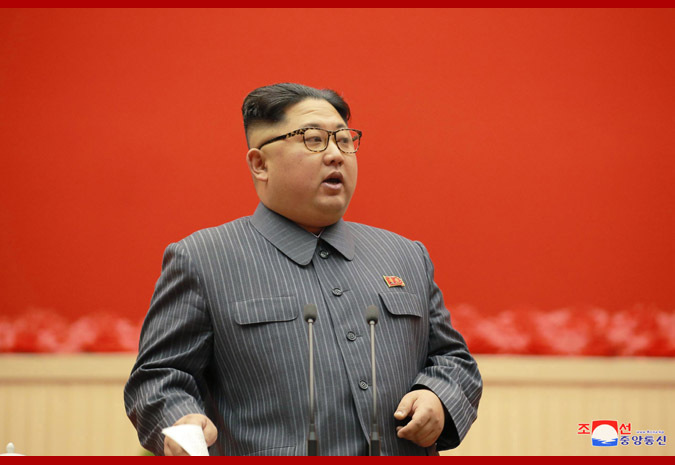 This amounts to a declaration that Japan would step up the preparations for aggression by citing the DPRK and neighboring countries as pretexts. The rhetoric about "threat from surrounding areas" oft-repeated by Japan is little short of a prelude to an reinvasion aimed to paint their criminal nature of rushing headlong into turning the country into a military giant as "legitimate" and openly come out for overseas expansion. The past history shows that loud rhetoric about "threat from surrounding areas" heard from the Japanese archipelago made the country rapidly lurch toward right and militarist and heated up the zeal for reinvasion. UNSC sanctions resolution 2397 is another act of US state terrorism against People's Korea . It is the 10th UNSC sanctions resolution against People's Korea. 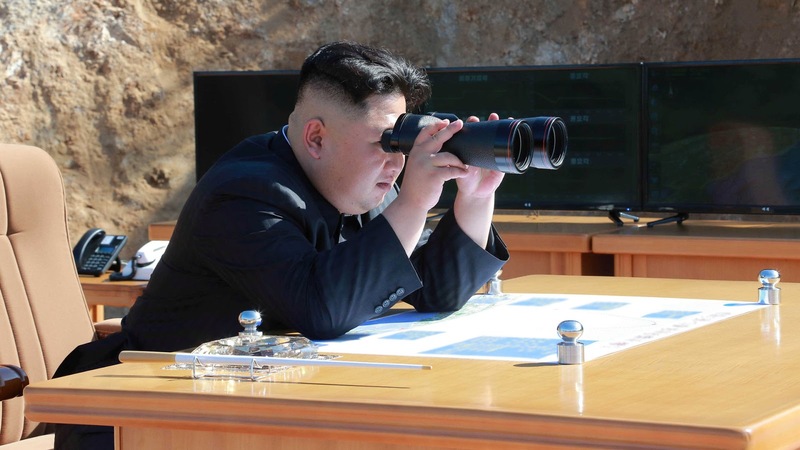 The US and its acolytes in the UN need to reflect on the fact that since 2006 , for 11 years , the UNSC has been imposing sanctions on the DPRK but it has failed to stop the DPRK's nuclear and ICBM . Since the UNSC first imposed sanctions on People's Korea for nuclear tests , there have been 5 nuclear tests . The DPRK has also made big sccessses in its ICBM programme . 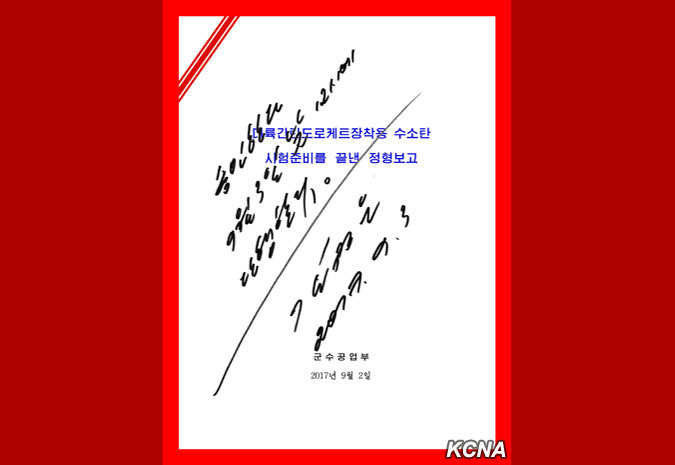 Basically the DPRK has implemented the line of developing the nuclear force and economy in parallel under the banner of Juche and self-reliance. What the latest sanctions resolution proves is that the US imperialists are the sworn enemy of the Korean people with whom the Korean people can no longer live with . 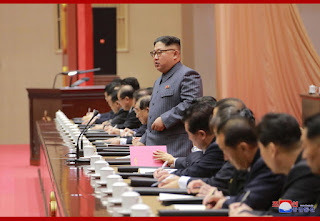 As for the big powers that colluded with the US imperialists in passing the resolution , these countries are now exposed to the world as acting from narrow self-interest and sacrificing the interests of a neighbouring country , the DPRK , for their interests. These countries will pay a heavy price . 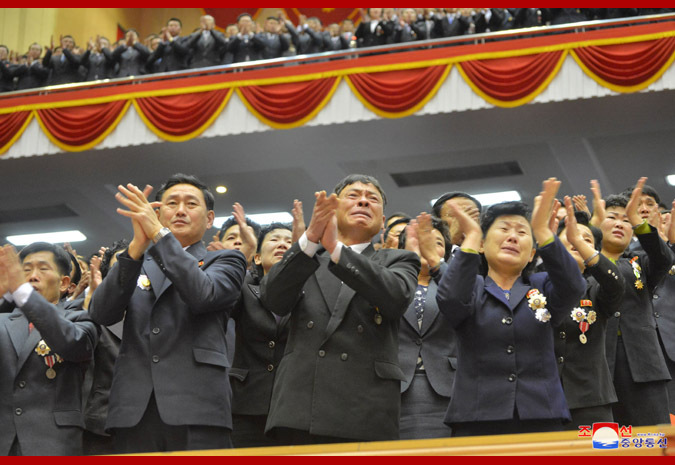 the Korean people railed around the Juche idea and Songun idea will defeat the UNSC sanctions ! 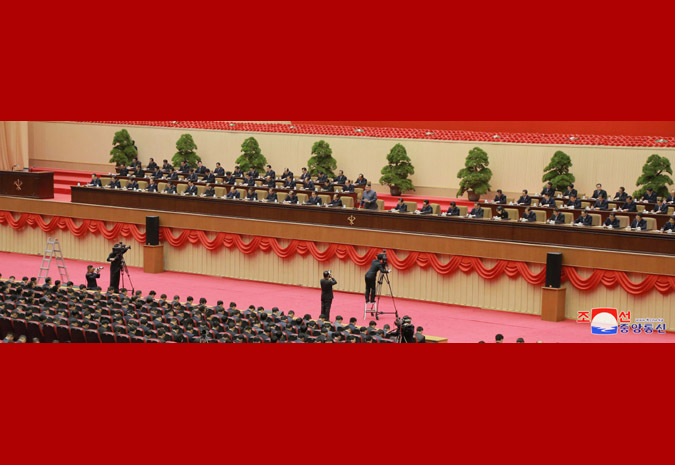 Pyongyang, December 25 (KCNA) -- In the closing days of 2017 the world is clearly seeing the image of the DPRK that has towered as a new strategic state. The U.S. journal National Interest in a commentary on Dec. 15 wrote that 2017 was a special year for north Korea in which it possessed direct deterrence to the nuclear blackmail of the U.S. 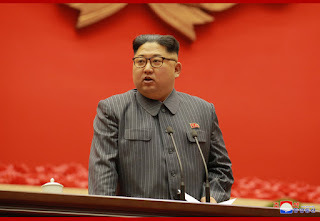 It added that the most important lesson drawn this year is that north Korea is firm in its will at nuclear possession and it is ready to risk anything to this end. Threat would never stop north Korea. If there is anything Trump taught us this year, it is the fact that north Korea would never abandon its nuclear program. 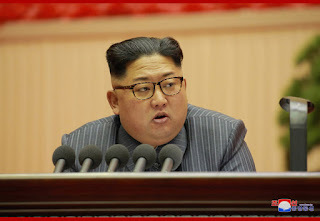 The Washington Post, the British weekly magazine The Week and other Western media and experts in Korean issue have become strong in their assertion that the DPRK is now possessed of nuclear deterrence and there is nothing the U.S. is able to do with this and that the U.S. should recognize the DPRK's nuclear possession. The former foreign minister of Poland on Dec. 17 said that the DPRK is a nuclear power and it will further consolidate its position. This is the unanimous acknowledgement of the international community of the undeniable tremendous might and unchangeable strategic position of the DPRK. Acknowledgement is the basis of thinking and a starting point of action. The U.S. has so far drunken bitter cups in decades of stand-off with the DPRK because it took the DPRK wrong. 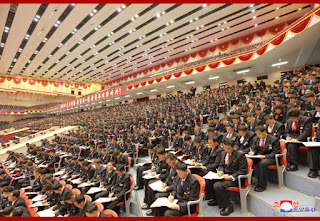 Whether it took the DPRK as a weak nation or a subject country which moves at the beck and call of a big power or as a government which would collapse out of its own accord, it is all prompted by the U.S. ignorance of the DPRK, its inveterate repugnancy against the DPRK and arrogance looking down on others. 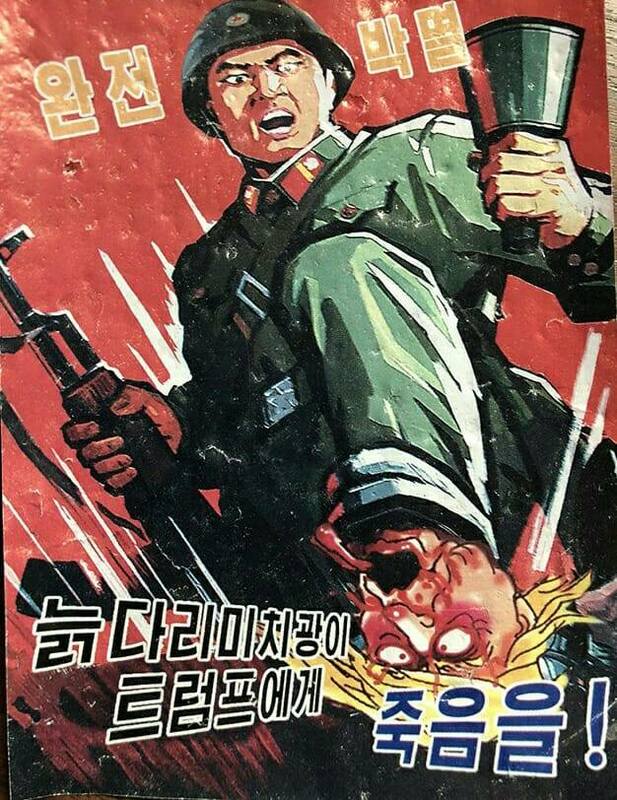 Today the U.S. and hostile forces are taken aback by the tremendous might of the DPRK. 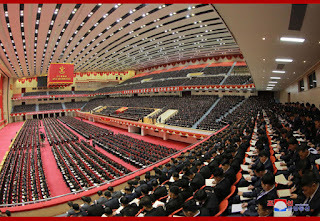 But if they understand the ideology, history and tradition of the DPRK, they will admit that it is the inevitable result. 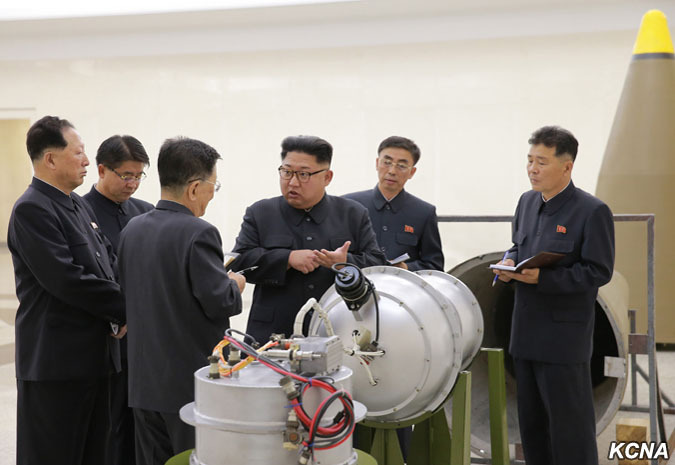 This year the DPRK has made rapid progress beyond imagination in completing the state nuclear force and realizing the cause of building a rocket power under the wise guidance of the respected Supreme Leader. 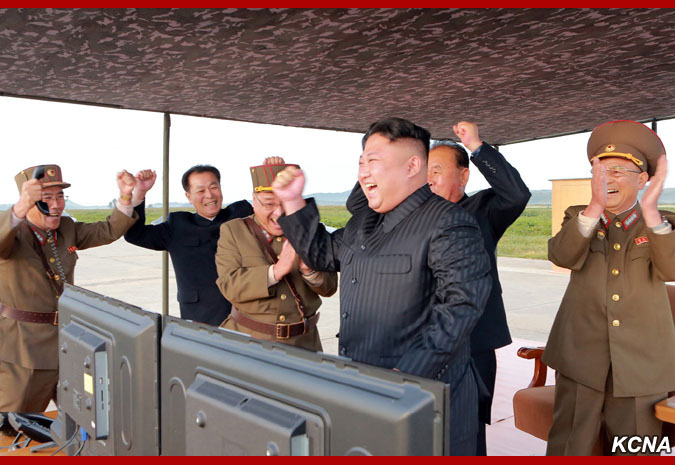 Finally, an end is put to the days when the U.S. used to threaten the DPRK with nuclear weapons, and the theatre of the final battle between the DPRK and the U.S. has definitely moved to the U.S. mainland across the Pacific. A fundamental change has also been brought about in the international community's perspective and acknowledgement of the overall state might and strategic position of the DPRK. 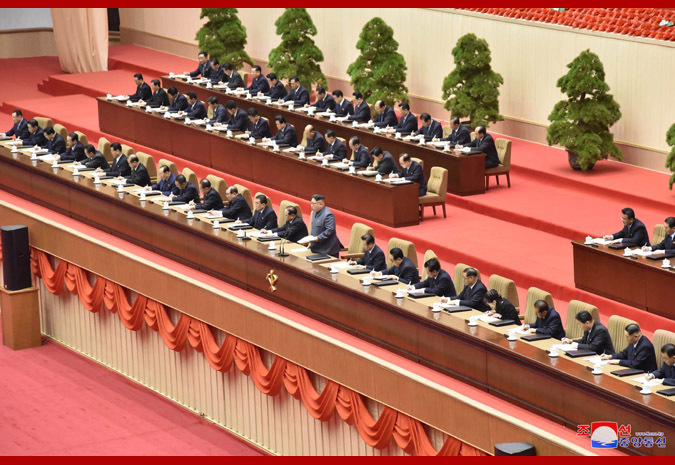 Through this year's struggle, the Korean people keenly realized once again the validity of the Workers' Party of Korea's line of simultaneous development of the two fronts, and they will advance with confidence along the road of socialism despite manifold difficulties and hardships. No force on the earth can bring down the powerful DPRK. 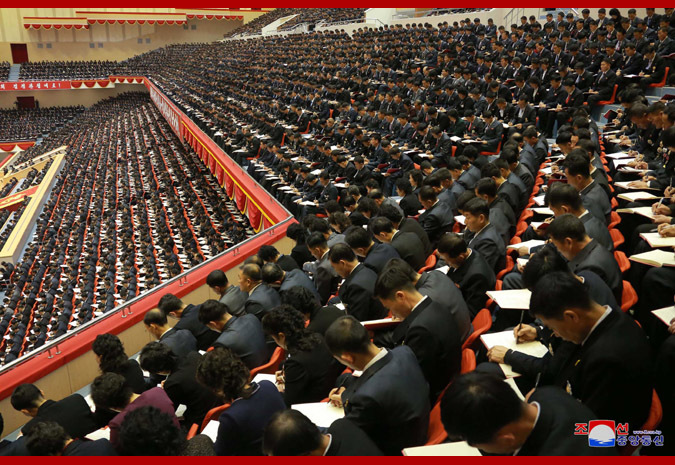 The U.S. has to make a bold decision to write a new chapter of the DPRK-U.S. relations, by setting in order its thought though belatedly. 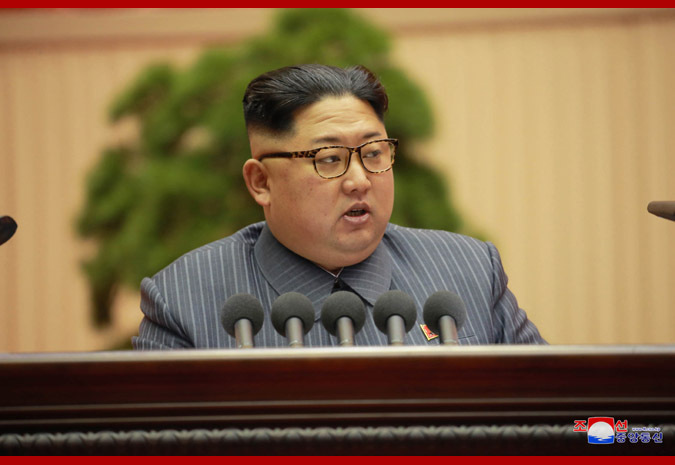 Pyongyang, December 25 (KCNA) -- A spokesman for the Korea Asia-Pacific Peace Committee (KAPPC) in a statement Monday denounced the U.S. for committing another state-sponsored terrorism as adoption of anti-DPRK "sanctions resolution" 2397 on Dec. 23 after threatening and appeasing the UNSC member nations for over 20 days, taken aback by the DPRK's success in the test-fire of ICBM Hwasong-15. 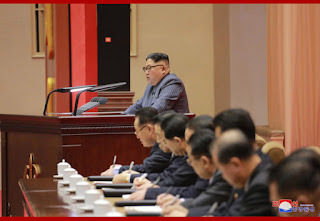 Despite barbarous "sanctions resolutions" which the U.S. cooked up on nine occasions with the mobilization of every possible means and method, the DPRK kept to the path of nuclear possession for self-defence and finally realized the historic cause of completing the state nuclear force. 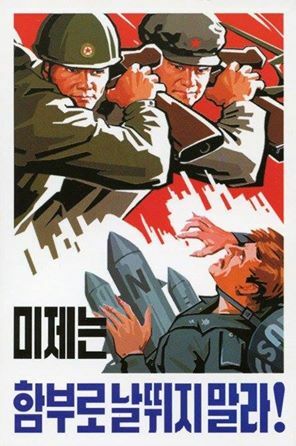 It would be a great mistake to think that the 10th "sanctions resolution" would browbeaten the DPRK. 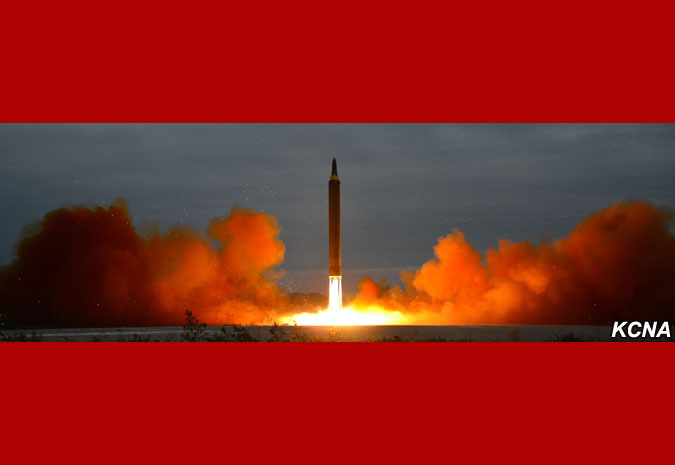 The U.S. should imagine what a catastrophic consequence it will face for whatever it takes against the world-level nuclear power DPRK - whether it is the sanctions resolution or military attack- before going wild. 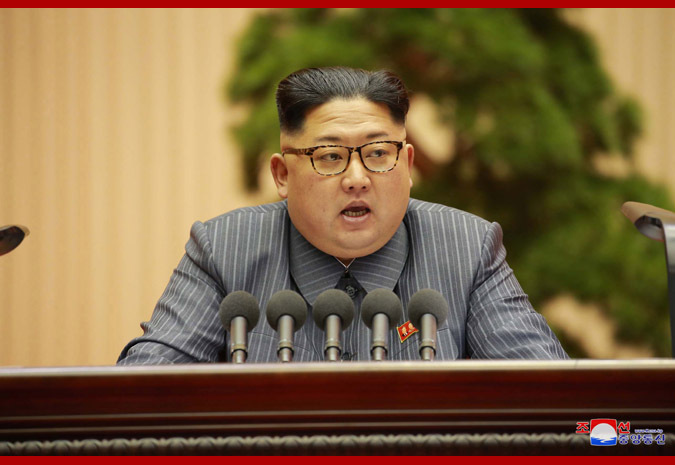 It is common sense that escalating sanctions and pressure on the Korean peninsula, arsenal in Far East, would heat up the nuclear detonator. The neighboring countries will be forced to make belated regret, if they harbor the foolish illusion that their support for the sanctions under the coercion of the U.S. would ensure security and pacify the surrounding situation and do not give up the despicable inner calculation of meeting their own selfish interests at the sacrifice of neighbor. Explicitly speaking, our nuclear weapons are the ones of justice targeting the U.S. which has constantly threatened and blackmailed the DPRK with the tyrannical nuclear weapons, bringing dark clouds of a nuclear war to hang over us. It is never the ones of threatening China, Russia, and countries in Europe and Africa. Time has come for the whole world to see clearly whose nuclear weapons defend the peace and stability in Korean peninsula and the rest of Asia-Pacific- the nuclear weapons of the brigandish U.S., enemy common to humankind, or the nuclear weapons of Juche Korea, fortress of independence and justice. Pyongyang, December 25 (KCNA) -- Kim Jong Un, chairman of the Workers' Party of Korea, chairman of the State Affairs Commission of the DPRK and supreme commander of the Korean People's Army, had a photo session with the participants in the 5th Conference of the WPK Cell Chairpersons on December 24. 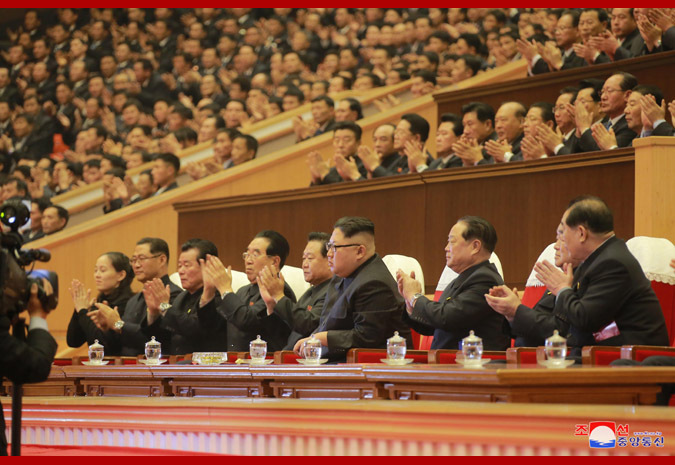 When respected Supreme Leader Kim Jong Un appeared at the venue of the photo session, the participants enthusiastically welcomed him, extending the highest glory and warmest greeting to him. He warmly waved back to them. 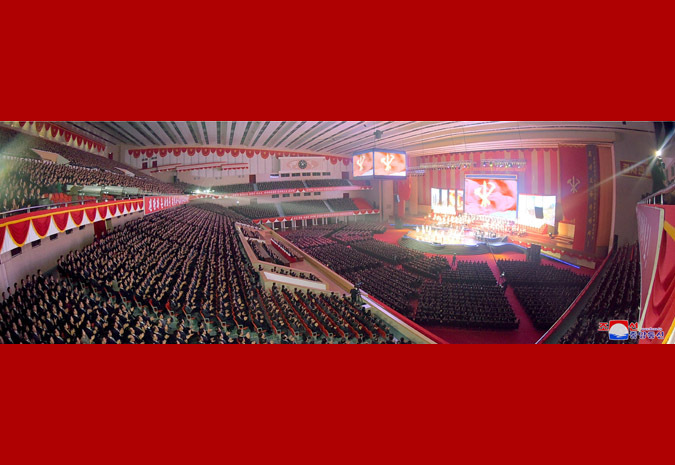 Warmly congratulating the participants for having consolidated the Party cells to be flagship organizations in carrying out the idea and cause of the Party and taken the lead in devotedly working for the Party and the socialist country, he had a photo taken with them. When the photo session ended, the participants broke into thunderous cheers of "hurrah!" in token of their deep reverence for him. 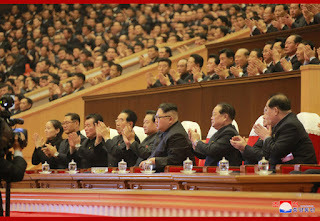 He expressed expectation and belief that the participants would cherish the main spirit of the conference and consolidate all the Party cells to be loyal ones and vanguard ranks for the implementation of the Party's policy, as required by the developing revolution which has reached a fresh higher level. DPRK Embassy in Peru had been declared 'persona non grata' , basically expelled from the country . This follows the expulsion of the DPRK Ambassador from Peru a few months . In means that Peru has virtually severed relations with the DPRK . We condemn this very hostile action against People's Korea by the Peruvian reactionaries who are acting as puppets and vassals of US imperialism. and evil . They aim to blockade People's Korea and deprive it as its sovereignty . The DPRK FM correctly says "We define this "sanctions resolution" rigged up by the U.S. and its followers as a grave infringement upon the sovereignty of our Republic, as an act of war violating peace and stability in the Korean peninsula and the region and categorically reject the "resolution". The DPRK is totally just to reject the so-called 'resolution' . It is indeed an act of war . laws by carrying out ICBM tests on its own soil. Other UN member states test missiles and are not punished in this way . 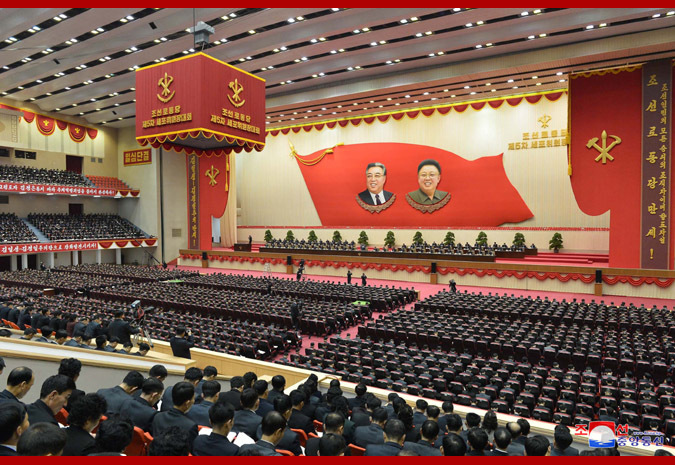 undermine Juche-based socialism of People's Korea. 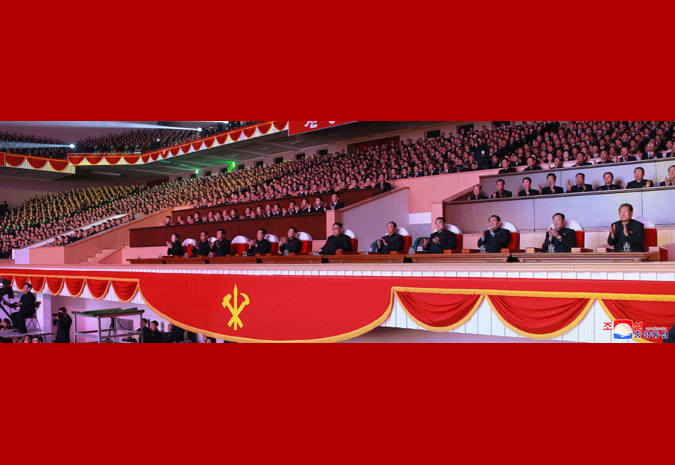 We call on friends of People's Korea to step up militant actions in support of the DPRK and campaign against the unjust sanctions ! The United States, completely terrified at our accomplishment of the great historic cause of completing the state nuclear force, is getting more and more frenzied in the moves to impose the harshest-ever sanctions and pressure on our country. On December 23, the U.S., while denouncing our successful test launch of ICBM Hwasong-15, cooked up once again the UN Security Council "sanctions resolution" 2397 which is tantamount to complete economic blockade of the DPRK. We define this "sanctions resolution" rigged up by the U.S. and its followers as a grave infringement upon the sovereignty of our Republic, as an act of war violating peace and stability in the Korean peninsula and the region and categorically reject the "resolution". The reason we have achieved the great cause of completing the state nuclear force, overcoming all kinds of hardships and weathering through manifold difficulties is to safeguard the sovereignty and territorial integrity of the country, ensure the peaceful life of the people and reliably guarantee peace and security of the Korean peninsula and the world against the nuclear blackmail policy and nuclear threats of the U.S imperialists. As we have stated several times, our nuclear weapons are self-defensive deterrence that does not contradict any international law since we have developed and completed them in a fair and legitimate way outside of the Treaty on the Non-Proliferation of Nuclear Weapons in order to put an end to the hostile policy and nuclear threats and blackmail of the U.S. It is a philosophical truth we have found through the past showdown with the U.S. that strengthening the powerful nuclear deterrence in every way is the only way to frustrate the moves of the U.S. who makes it its daily business to carry on military threats and blackmail in every region to realize its preposterous dream of hegemony over the world, advocating the "America First Policy" based on force. There is no more fatal blunder than the miscalculation that the U.S. and its followers could check by already worn-out "sanctions" the victorious advance of our people who have brilliantly accomplished the great historic cause of completing the state nuclear force, the cause of building a rocket power capable of coping with any nuclear war against the U.S. 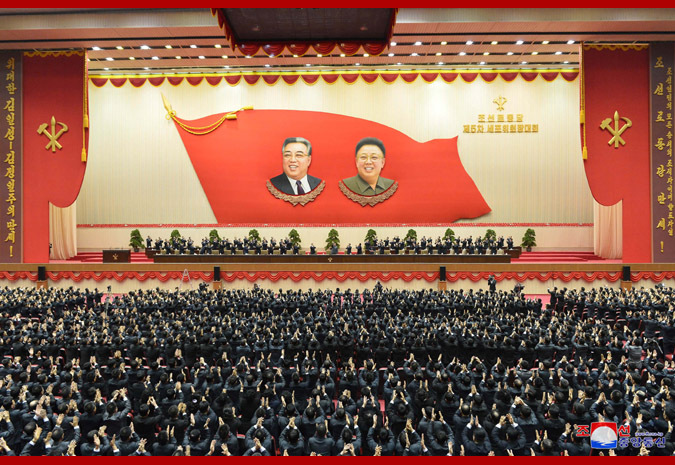 The U.S. should not forget even a second the entity of the DPRK which rapidly emerged as a strategic state capable of posing a substantial nuclear threat to the U.S. mainland. 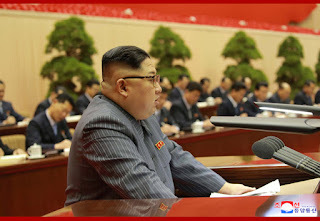 If the U.S. wishes to live safely, it must abandon its hostile policy towards the DPRK and learn to co-exist with the country that has nuclear weapons and should wake up from its pipe dream of our country giving up nuclear weapons which we have developed and completed through all kinds of hardships. Those countries that raised their hands in favor of this "sanctions resolution" shall be held completely responsible for all the consequences to be caused by the "resolution" and we will make sure for ever and ever that they pay heavy price for what they have done. Whatever difficulties and challenges lie ahead of our road of advance, we neither feel disappointed nor are afraid of them but are optimistic about brighter future, and no force in the world can break our people's indomitable spirit. 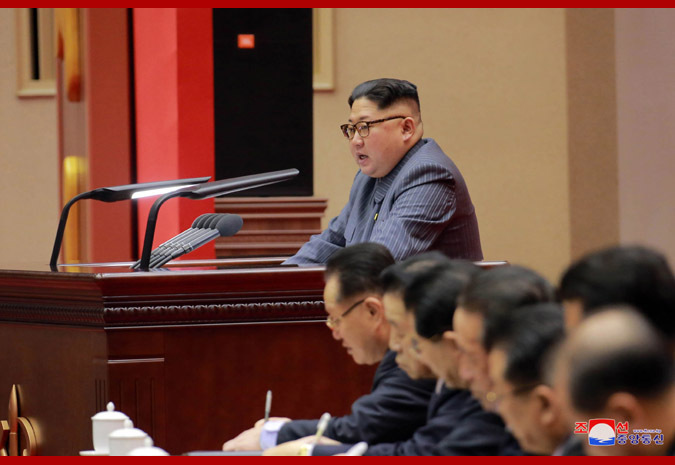 We will further consolidate our self-defensive nuclear deterrence aimed at fundamentally eradicating the U.S. nuclear threats, blackmail and hostile moves by establishing the practical balance of force with the U.S.
Pyongyang, December 24 (KCNA) -- Kim Jong Un, chairman of the Workers' Party of Korea, made a historic speech "Let Us Strengthen Party Cells into Loyal Cells, into Vanguard Ranks for the Implementation of the Party's Policies" at the third-day meeting of the 5th Conference of the WPK Cell Chairpersons on December 23. 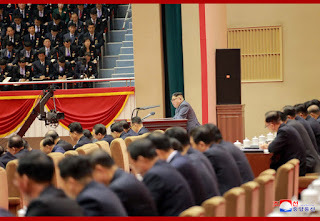 Noting that successes and experience gained in the work of the Party cells after the Forth Conference of the WPK Cell Secretaries and defects existing or betrayed in their work were correctly analyzed and reviewed at the current conference, Kim Jong Un said the conference offered an important occasion in fixing a right orientation in the future efforts for further strengthening the Party cells. Stressing that the WPK is now faced with the tasks to attain the higher goal for building a powerful socialist nation advanced at the 7th WPK Congress by enhancing its guiding ability and working efficiency under the unfurled banner of modeling the entire Party on Kimilsungism-Kimjongilism, he said lower-echelon Party organizations, notably the Party cells, should further their function and role and launch positive activities in order to successfully carry out the important tasks facing the Party. 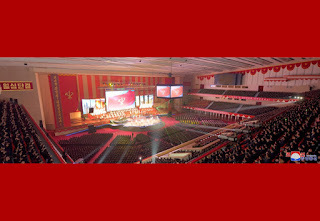 The working efficiency of the Party cells has been further strengthened and lots of improvements have been witnessed in the traits and working style of the cell chairpersons since the Fourth Conference of the WPK Cell Secretaries but the working style, power of execution and activities of the party cells have not yet reached the level wanted by the Party Central Committee. 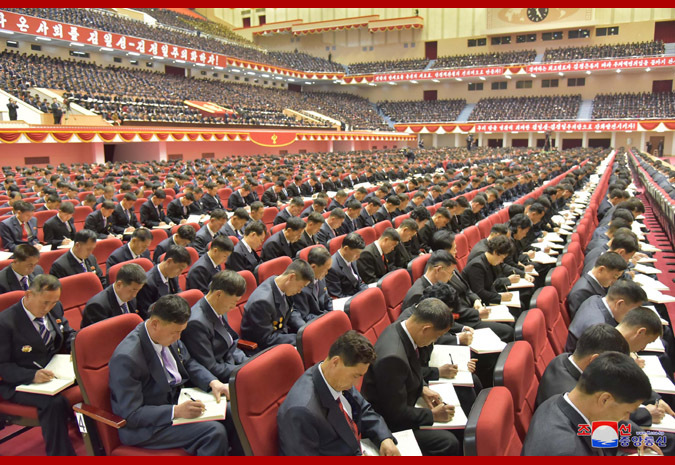 The Party cell chairpersons should strengthen the organization and guidance over the party life with main emphasis on the work to firmly prepare all party members of the cells to be steadfast revolutionaries, true Kimilsungists-Kimjongilists. 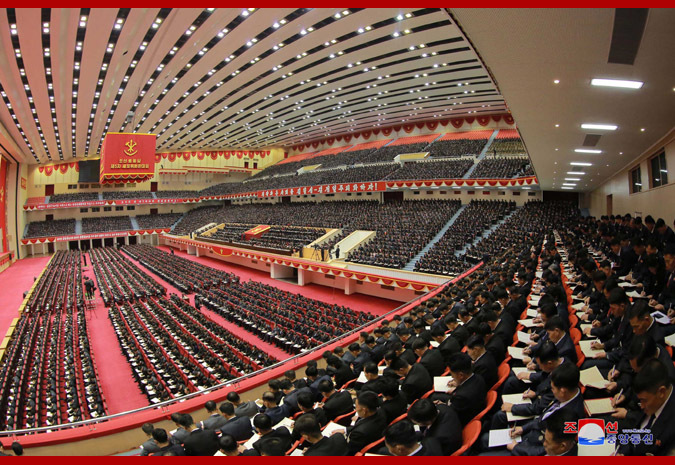 They should direct their primary attention to strengthening the ideological life of the party members and deepen the five-point education. They should meticulously guide and control the organizational life of the party members with main emphasis on the work to thoroughly establish the Party's unified leadership system and enhance the spirit of the party members. They should strengthen self-criticism and criticism among the party members so as to actively combat all unsound practices. There can not be a special person in the party life and the double standards of discipline should never be allowed in the party cells, he noted, stressing the need for the party cells to which officials belong to make a strict demand for the party life of officials so that they may take a sincere part in the party life with the attitude of ordinary party members and work in high-tension atmosphere under the education and control by party organizations. 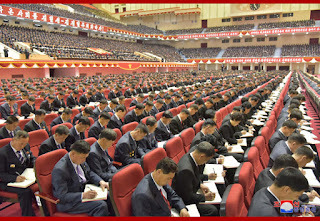 He called upon the party cell chairpersons to put main emphasis of the party cell work at present on implementing the decisions of the Second Plenary Meeting of the 7th Party Central Committee and attaining the goals of the five-year strategy for national economic development and to arouse all the party members and other working people to the drive for carrying out them. He referred to non-socialist practices harmful to defending our-style socialism at present, and stressed that they occurred because the party organizations, working people's organizations and officials failed to persistently conduct education among the party members and other working people and intensify ideological struggle. 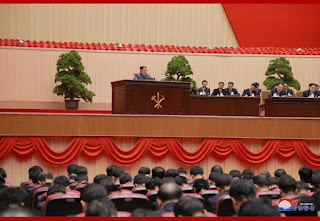 Underscoring the need for conducting revolutionary offensive to uproot non-socialist practices, he said the offensive should be launched in the party cells, the bases educating the party members and other working people and training them into revolutionaries and the lowest revolutionary posts defending Korean-style socialism. The issues arising in enhancing the militant function and role of the party cells should be reflected in the working plans of the party committees, and party officials should personally go into the party cells to help them. The work to make loyal party cells should be dynamically pushed ahead and the party leadership should be deepened so that the loyal party cells can hold fast to and continuously glorify their honor. 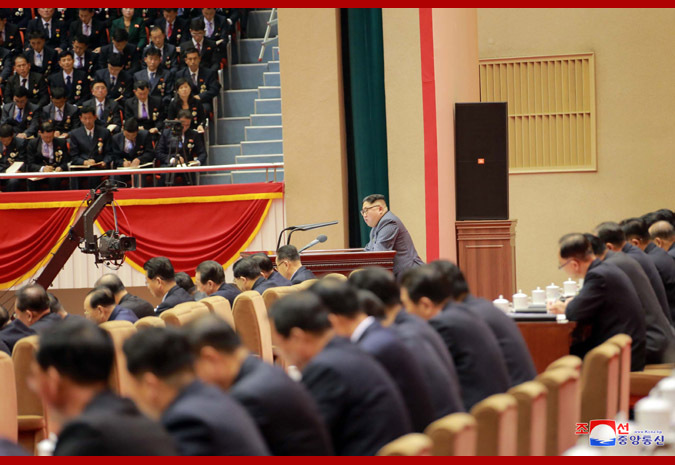 Pyongyang, December 24 (KCNA) -- Kim Jong Un, chairman of the Workers' Party of Korea, guided the 5th Conference of Cell Chairpersons of WPK held from Dec. 21 to 23 amid the deep concern and expectation of all party members and other people of the country, and made a closing address. Kim Jong Un said that the conference was successfully held thanks to the high enthusiasm of all the participants, adding that the Conference set forth proper orientation of struggle for the subsequent period before coming to a closure. He said that the conference recalled the position held by party cells in strengthening the party and putting into practice the party's idea and intention, and the importance of duties assumed by party cell chairpersons, adding the conference clarified tasks and ways for strengthening the party cells at present. 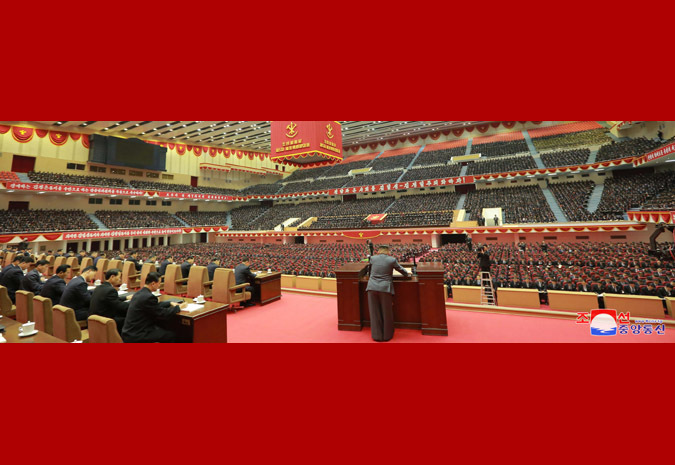 The conference would offer an important occasion in further enhancing the function and role of the party cells as required by the prevailing situation and the developing revolution and in strengthening the leadership and militant ability of the party, he stressed. The basic spirit of the conference is to turn all party cells into loyal cells, vanguard ranks implementing the party policies and bring about a fresh turn in the drive for strengthening the party and building a socialist power, he added. Noting that it is heavy yet responsible work to strengthen the party cells into loyal cells and vanguard ranks of implementing party policies, he said with confidence that when all party chairpersons turn out with redoubled efforts, being conscious of the mission and duties assumed by them as primary political officials of the Kimilsungist-Kimjongilist party, the party cells would be strengthened, the militant power of our party would grow stronger and our revolution would make faster advance. 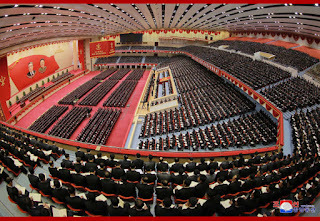 He stressed the need for all the cell chairpersons of the whole party to refresh determination and harden fighting spirit with the conference as momentum, to devote strength, wisdom and enthusiasm to rallying the party members and other working people close around the party, to become vanguard fighters and true educators of the popular masses who are making the breakthrough in the van whenever they are faced with difficulties and hardships and to arouse the masses into implementing the party policies. 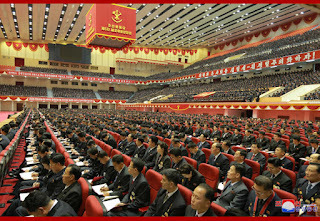 It is the traditional fighting mode of the WPK to strengthen the party cells, militant units directly in charge of carrying out the party policies, enhance the leadership role of the party and effect a surge in the revolution and construction, he said, adding that our party will invariably carry forward this tradition in the future, too, and keep putting big efforts into prioritizing party cells and strengthening them. 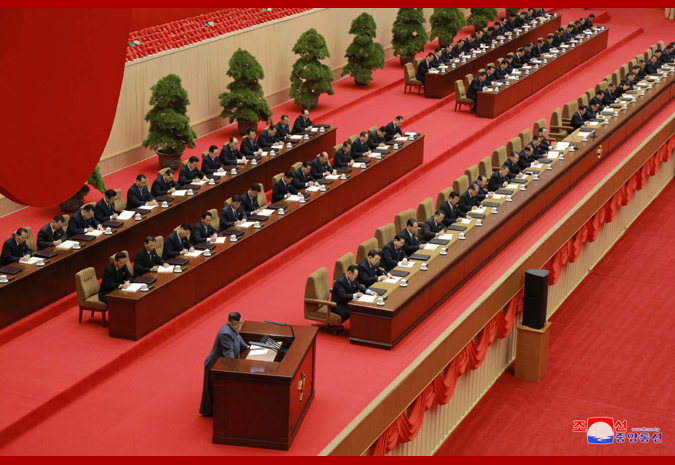 He called on party organizations at all levels and party officials to cherish the party's idea and policies on prioritizing party cells and devote all efforts into strengthening all party cells into faithful cells and vanguard ranks implementing the party policies. 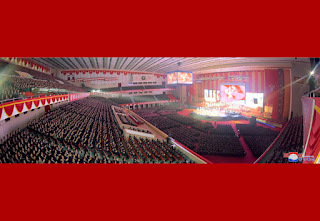 He said with pride that even though we may face manifold difficulties and hardships in the ways ahead, the Party Central Committee feels reassured as there are hundreds of thousands of cell chairpersons, core members loyal to the party and vanguard fighters for carrying out the party policies, and millions of party members. 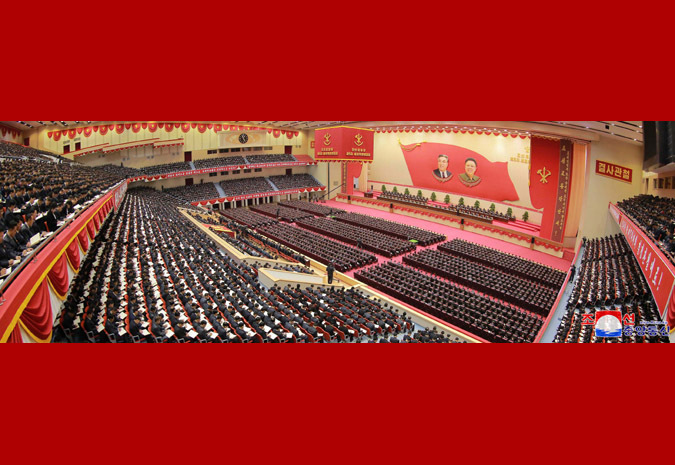 What we have done is just the beginning and the Party Central Committee plans to conduct more new projects for the people, he said, noting it will to courageously carry out operations in a big and bold way for building a socialist power with trust put in party cell chairpersons. He stressed that the participants in the conference should cherish deep once again what heavy responsibility they have assumed before the party and the revolution and at what an important post they are working.